PRODUCT: 1/4" X 1-1/4" LONG ZAMAC HAMMER NAILIN ANCHOR, ZINC PLATED STEEL PIN WITH MUSHROOM HEAD, ZAMAC BODY. 500/BOX. PRICE/BOX. 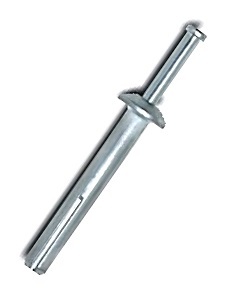 1/4 inch X 1-1/4 inch Long Zamac Nailin Concrete Anchor. Mushroom-Head Zamac Body with Zinc Plated Carbon-Steel Nail. For Concrete, Block or Stone. Made in USA by Powers. Price/100.